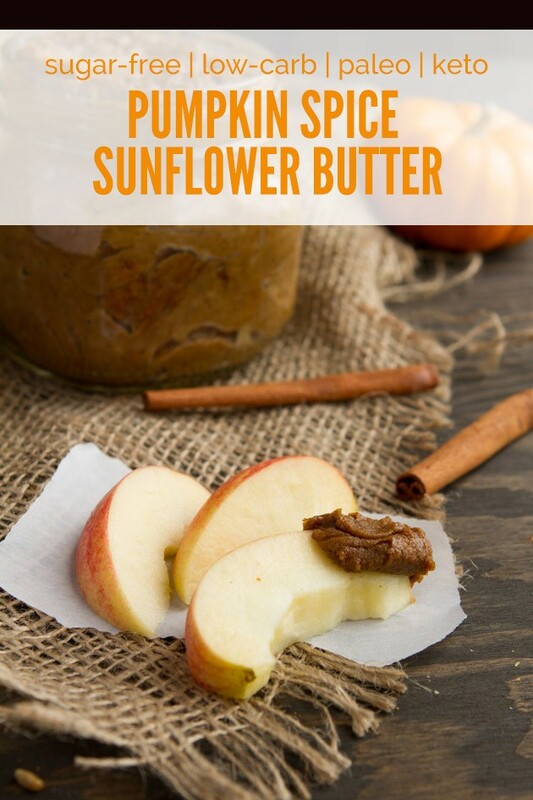 Keto sunflower butter made festive with pumpkin puree and warming pumpkin spices. Slather on a fresh-cut apple, make into keto fat bombs… or enjoy from a spoon. With snow hitting the ground yesterday, it seemed like the perfect time to stay indoors and consume copious amounts of pumpkin create something festive and keto. 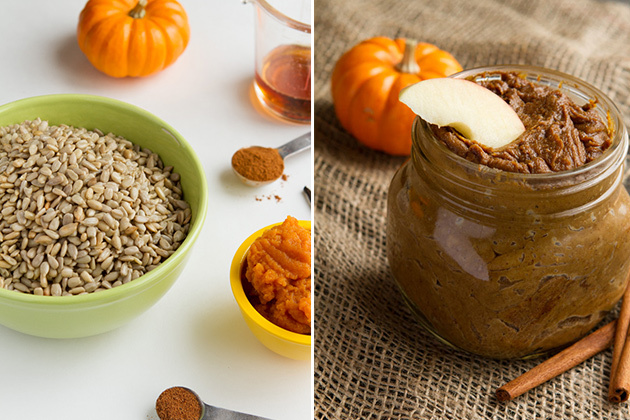 The only way Kevin will eat pumpkin is roasted and mashed with ghee (like mashed potatoes). So I knew that whatever keto recipe I whipped up yesterday would be mine, all mine! One of the most-popular pumpkin keto recipes on the blog right now are these Keto Fat Bomb Pumpkin Pie Patties. I’ve seen some of our keto readers mash all of the keto ingredients together and make a slab of keto pumpkin fudge, pop them in their purse for quick keto fatty action, or blend them into their coffee (like a keto Rocket Fuel Latte Block). I decided to keep with the fatty keto theme and create something I could slather on keto things. I feel like Fall is the season of slathering. You feel me? I’ve made this keto recipe as versatile as possible, with many variations depending on your preferences and food sensitivities. Nut-free, sugar-free, drippy, or thick, it’s entirely up to you. … but liking (or loving) pumpkin is a definite requirement. 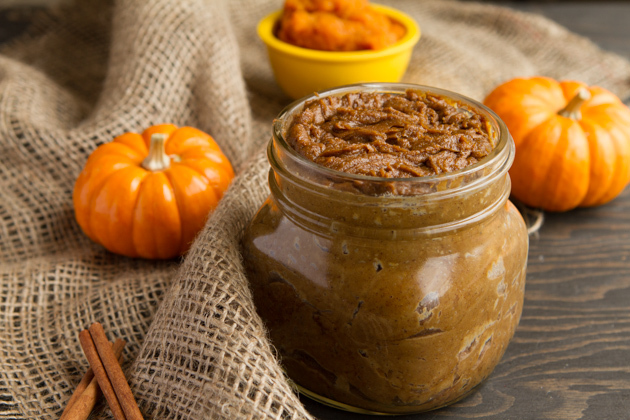 Keto sunflower butter made festive with pumpkin puree and warming pumpkin spices. Slather on a fresh-cut apple, make into keto fat bombs... or enjoy from a spoon. Preheat oven to 325F and place sunflower seeds on a baking sheet. Roast in the oven for 15 minutes, rotating every 5 minutes until seeds are slightly browned. 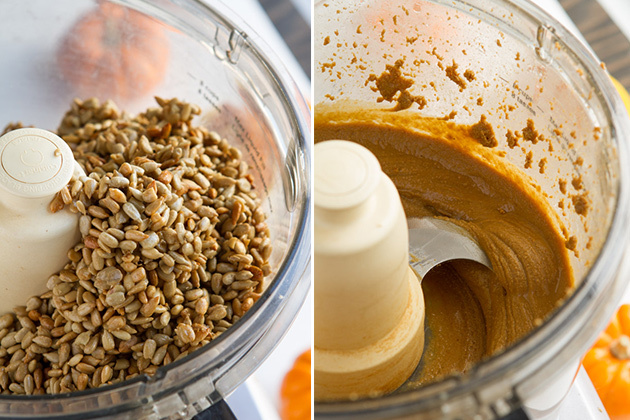 Transfer seeds to the bowl of your food processor or high-powered blender. Add oil, set on high and process until smooth. Add remaining ingredients and blend, just until combined. 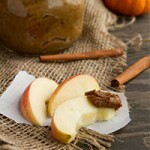 Transfer to a mason jar and store in the fridge for up to 5 days. If you can't get through the whole batch in that time, transfer some to cute silicon molds and freeze for pumpkin fat bombs! If you're making fat bombs, it'll be better to use full-fat coconut milk. Sunflower Seeds: You could also use hemp seeds, sesame seeds or pecans. Dairy-free Milk: Feel free to use any dairy-free milk you'd like to here. If you want the butter thick, start with ¼ cup milk. If you want it drippy and more dip-friendly, go upwards of ¾ cup. The butter in the photos is with ¼ cup but I found it to be too thick. I made a second batch with ¾ cup and it was drippy, perfect for dipping! Maple Syrup: If maple syrup is used, this keto recipe may be a bit too high in sugar for keto. You could also try xylitol. Me + You in Vancouver, 3 weeks! Are you a health practitioner or holistic health entrepreneur wanting to build a thriving health and wellness business? I am honored to be one of the expert presenters at The Wellness Business Summit Vancouver 2015, a 2-day LIVE event centered on business building and marketing, sales and mindset training specifically for the leaders in the health and wellness niche. So if you want to meet in person, hang out and learn how I’ve created my dream business (information that I’m only sharing during my presentation) then you have to join me at The Wellness Business Summit, October 23 and 24 in Vancouver, British Columbia. Like anyone else, I get little nervous doing live presentations so it will be nice to have some friendly faces in the audience. Looking forward to hanging out in Vancouver, in October.